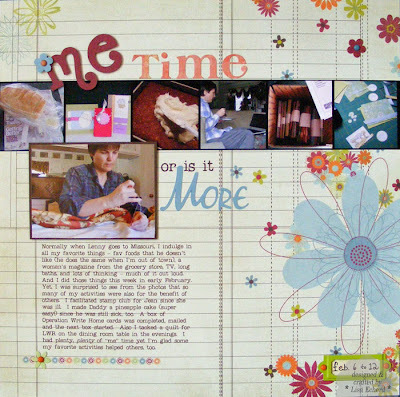 The background for this layout is from Fancy Pants' Delight collection. There were so many great flowers printed on the ledger paper that I only added a few embellishments to my photo strip and journaling. For the title I used a combo of stickers from Basic Grey and the Cricut with SCAL software. The only real time consuming part of this layout was figuring out what fonts to use for my letters. I'm finally creating a master sample of fonts in SCAL software to quickly see what the fonts really look like when letters are cut from them. When I get that done, I'll post in a TIPsy Tuesday entry. One tiny embellishment was this row of rub-ons from the same collection. 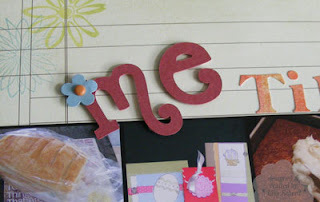 A few flowers were added with Papershaper flower punches and brads. When my husband visits his family in Missouri, I always enjoy some favorite simple activities. 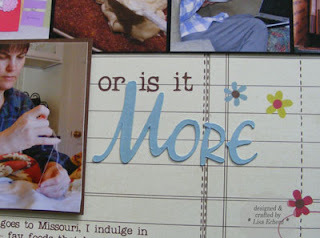 I snapped photos as the week went along of me baking, quilting, making cards, etc. I was pleasantly surprised to find several of the activities last week were of benefit to others. Now, I had plenty of ME time which I thoroughly enjoyed. But I'm glad I have some hobbies that I not only enjoy but help others, too. Ink: Baja breeze and Kiwi Kiss from SU!